On Primary Election Day, 82-year-old Robert Wright drove to Evans Tower on 24th Street in north Omaha from his home at 9th and Fort Streets. He heard on television that Evans Towers was a polling place. Because he hadn’t received a card in the mail telling him where to cast his vote, he figured someone at Evans Towers could at least give him that information, as he did not have internet access to look it up. Poll workers told him to drive to the pavilion at Miller Park. He used to vote at Sherman School, about five blocks from his home. His new polling location at Miller Park was 3 miles away. The Election Inspector at Miller Park also lived in east Omaha. It is a neighborhood of small houses and trailer parks in the flats near the river just west of Eppley Airfield. He had been a poll worker for 20 years and was troubled that very few of his neighbors came to Miller Park to vote. “I’d see more people from the neighborhood, if we were in the neighborhood,” he added. For most Douglas County voters, finding a new polling place has been an additional challenge this election cycle. Mere months before the primary, Douglas County Election Commissioner Dave Phipps announced that, in the name of cost-cutting, he had reduced the number of precincts by half and trimmed the number of polling places by one-third. It was the fourth such move by a Republican politician or appointee to change voting in Douglas County ahead of the 2012 election. Many organizations believe this is part of a nationwide effort to suppress voters in traditionally Democratic areas. Many of the same groups in Douglas County have been hit hardest by Phipps’ decision. According to The Reader’s analysis of the data, Phipps’ changes hit poorer, less educated and more diverse areas of the city harder than richer, more educated, less diverse areas by a relative factor of three to five times. For those who live east of 72nd Street, the percentage of increase in distance to a new polling place is double that of those who live west of 72nd Street. Voter suppression concerns in Douglas County could have national implications. Lower turnout could take away the “blue dot,” the single electoral vote that Omaha gave to Barack Obama in 2008. Beyond the presidential election, the balance of power in the Senate and House could be impacted. The race between the repatriating Democrat Bob Kerrey and Tea Party Republican Deb Fischer promises to be in the national spotlight, while Lee Terry prepares for his toughest and best-funded opponent since 2008. In Nebraska two Republican-sponsored, election-related laws died before coming to a vote, while two laws concerning political boundaries advanced and set the stage for a dramatic change in polling places during the decennial redistricting. In 2011, LB 21 proposed returning Nebraska to a “winner-take-all” system in the Electoral College in an attempt to eliminate the “blue dot.” A Unicameral committee shelved the bill after Sen. Paul Schumacher of Columbus, a member of the Republican state central committee, voted with Democrats in a 4-4 deadlock. Schumacher, a Georgetown Law School graduate, objected to LB 21 on constitutional grounds. He explained that he would rather be true to the law than participate in partisan politics, denying the state Republican party one of its top legislative priorities. He said that Nebraska and Maine, by pledging their electoral votes to reflect the votes of the congressional districts, were more in step with the “one-man, one-vote” intent of the 14th Amendment to the Constitution. Also in this session, LB 239 would have required voters to show state-issued ID. It met with widespread opposition for costs and threats of voter suppression, At least 23 groups, including the Nebraska Association of County Officials, the League of Women Voters and the Douglas County Commissioners, went to the Capitol to protest. Adam Morfeld of Nebraskans for Civil Reform reasoned that “Douglas County has a highly urban and thus mobile population. Potential voter ID laws that require identification with a current address have a disproportionate impact on youth and mobile, often low income, populations.” Opposition to the bill solidified into a long filibuster, effectively killing it. LB 704 redrew congressional districts after the 2010 Census, shrinking the “blue dot” by swapping Bellevue and Offutt Air Force base in Omaha’s 2nd Congressional District with western parts of Sarpy county in the 1st Congressional District, centered in Lincoln. All 34 Republicans in the Unicameral voted for the redistricting plan, as did Democrat Norm Wallman of Cortland. Eleven Democrats voted against it, and three did not vote. According to figures gathered by a campaign manager for Lee Terry in the summer of 2011 and reported by the Lincoln Journal Star, before redistricting, there was a Republican advantage of 5,949 voters. The GOP edge over Democrats in the new District 2 is now 8,595 voters. In the floor debate, Republicans offered few reasons for the swap. State Senator Brenda Council (D) gave three reasons why LB 704 violated the rules of redistricting. First, it did not result in strict equality of population. Second, it was not true to the core geography of the district, meaning Bellevue is a part of Omaha and not Lincoln. And third, “Bellevue area residents are not going to get news coverage of 1st Congressional District activities. It doesn’t happen. Their news coverage comes from the channels that … cover the 2nd Congressional District and they report on events occurring in the 2nd Congressional District,” Council said. The cumulative effect of these Republican initiatives— attempts to change how electoral college votes are awarded in Nebraska, voter ID laws, redistricting the 2nd District in Omaha and drastically reducing the number of polling places—has set the stage for community protest. Douglas County spends less than $4 a year for each of its 316,667 registered voters. By comparison, Nebraska’s next two largest counties, Lancaster and Sarpy, invest significantly more in their elections. Lancaster has 198 precincts and 153 polling places for 177,266 voters, spending $5.36 per registered voter. They cut 25 precincts and 11 polling places. Sarpy has 52 precincts and 51 polling places for 95,265 voters, spending $5.33 per voter. They cut 25 precincts and 20 polling places. Phipps turned an internship in the Treasurer’s office working for Dave Heineman into a full-time job, dropping out of college. His duties included computer work and dealing with unclaimed property, such as safe deposit boxes and checking accounts that are technically “abandoned.” After six years in the Treasurer’s office, he says he spent a year in Arizona doing computer work but returned to Nebraska to work on Lee Terry’s 2002 reelection campaign. The story of how one man can change better than half of Douglas County’s polling locations has its origins in the 2000 primary, when “early voting” was first introduced in Nebraska. The initial response was tepid, only 3.8 percent. In more recent years, the phenomenon has increased substantially. According to Phipps, early voting in Omaha is closer to 30 percent now. Phipps was taking steps to increase the size of precincts and reduce the number of polls as far back as the fall of 2010. He and the Sarpy and Lancaster County Election Commissioners (all Republicans appointed by the governor) went to fellow Republican and State Senator John Nelson to write a bill addressing a number of election-related policy issues. The bill, LB 449, was discussed in committee on February 16, 2011, and according to the transcript, Secretary of State John Gale sent a deputy to provide neutral testimony with a few notable exceptions. Gale didn’t want election commissioners appointed by the governor to be able to run for office, and he considered the requested precinct size increase too high, from 1,000 expected voters to 3,000. The Secretary of State’s suggestion of 1,750 was eventually passed. In committee and on the floor of the legislature, no one raised the possibility that the number of precincts could be cut in half. On Cinco de Mayo 2011, LB 449 passed unanimously and was signed by the Governor a few days later. By early June, the new congressional districts in LB 704 were sent to every election commissioner in Nebraska’s 93 counties, and they each began creating voting precincts within the legislative districts. The Legislature and the election commissioners are working with two different sets of numbers. Congressional and state legislative districts are based on population. Precincts are based on registered voters who voted in the last statewide election—expected voters. Under this formula, a district with a low voter turnout can have a larger precinct size. Phipps told his geographic information service (GIS) team to use data from the 2008 presidential election because voter turnout was a record-breaking 73 percent. High turnouts would keep precinct sizes smaller. During the summer of 2011, two GIS experts began the painstaking process of plotting 315,000 registered voters into a “shape,” or mapping, file they would use to draw the new precincts. There are two important rules they could not violate: voting precincts must not cross state legislative boundaries and cannot exceed LB 449’s limit of 1,750 expected voters. By September, the GIS work was done. The Election Commission passed the new precincts on to Omaha to be split into seven wards and to the other municipalities in Douglas County. The eighth ward consists of all precincts in Douglas County that are not in the City of Omaha. Omaha drew their City Council wards and gave the maps back to the Election Commission in December 2011. According to City Councilman Pete Festersen, he had no idea of the changes coming. By January, the Election Commission began the final phase: selecting a polling place for the 185 new precincts. That job fell to one person in the commission—the Elections Resource Coordinator, Elizabeth Zorko. She chose polling places based on three simple criteria: Is the site compliant with the Americans with Disability Act? Are they willing to be a polling place for both the primary and the general election? Does the building have ample parking? Phipps told the Secretary of State about the cuts before he announced it publicly, leading to Gale’s warning email to the governor. Chapter 32 of the Nebraska statutes governing elections does not give the Secretary of State authority to override decisions of a county election commissioner. Where’s the system of checks and balances? “I have to have a Deputy Commissioner of the opposite party. If she sees something wrong, she should report it [to the press],” said Phipps. Functionally, no one reports to the Deputy Commissioner. When asked point blank if the position is just window dressing, Phipps would only say the “role is not well defined.” Phipps is confident that unless he does something illegal, like stuff the ballot box, he cannot be removed from his job. He has final authority to make decisions about how to run the office, including the ability to fire his deputy. In March, the announcement about the precinct and poll closings hit Omaha. Phipps was accused of voter suppression, unfair treatment of the poor, disabled and minorities. Democratic Senator Ben Nelson called for an investigation and the Justice Department sent two pairs of observers for the primary voting. The simple question was how the polling place changes would affect voters differently in various parts of the city and according to demographic characteristics. The strongest protests were coming from North and South Omaha and the African-American and Latino communities. Changing long-held voting patterns could in and of itself have a significant, adverse impact on voter turnout, according to Project Vote, but was that change relatively equal across Douglas County? Our analysis compared changes in distances to polling places for Douglas County voters in 2008 and 2012, by geo-coding every voter and the distance to their polling place. With that information, groups of voters and neighborhoods were matched to their census tracts to look at demographics using the 2006-2010 American Community Survey conducted by the U.S. Census—the most current data available. A detailed list of our process and copies of the data files is available here. DISPARITY BY GEOGRAPHY: If you live east of 72nd Street, the percentage increase in distance to your polling place is TWICE that if you live west of 72nd Street. DISPARITY BY INCOME: If you live in a census tract with a median household income between $25,000 and $50,000, the percentage increase in distance to your polling place is THREE TIMES that if you live in a census tract with a median household income above $50,000. 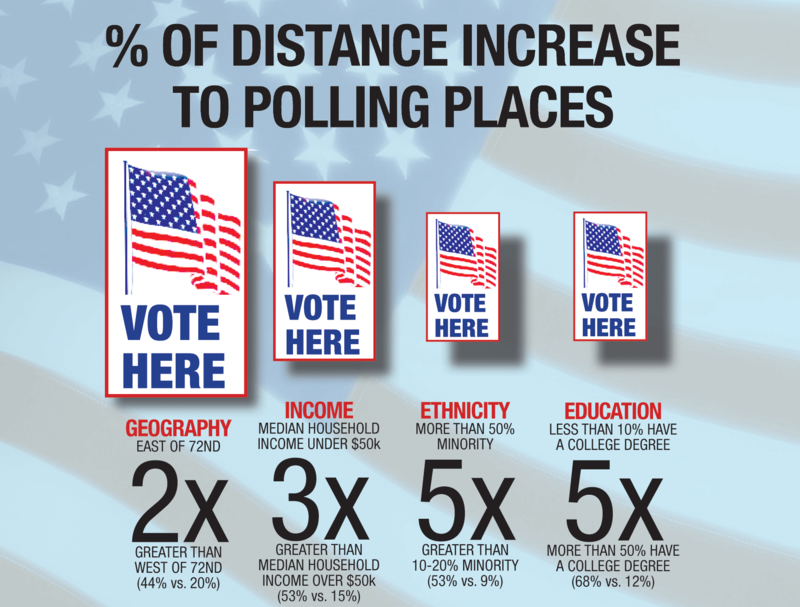 DISPARITY BY ETHNICITY: If you live in a census tract with a minority population in excess of 20%, the percentage increase in distance to your polling place is FIVE TIMES greater than if you live in a census tract with a minority population between 10-20%. DISPARITY BY EDUCATION: If you live in a census tract where less than 10%of the population holds a bachelor’s degree, the percentage increase in distance to your polling place is FIVE TIMES greater than if you live in a census tract where more than 50% of the population holds a bachelor’s degree. Eventually, Phipps apologized publicly, admitted he had made a mistake and began the long process of trying to fix it. These days, on Thursday mornings, he meets with a group of community activists from north and south Omaha. They are collaborating on selecting which polls to reopen and brainstorming about ideas to improve the voting process. Sergio Sosa of the Heartland Workers Coalition is part of the group. “Closing the polls has taught me more about how elections work than I knew before. Now we are working with the Commissioner to recruit bilingual poll workers, putting up more signs to tell people where to vote, and organizing voter registration drives. Instead of fighting with him, let’s fix this, let’s change it from the inside,” he said. Phipps will attend a public meeting in South Omaha on Wednesday, June 13 from 6-8 p.m. at Our Lady of Guadalupe Hall at 23rd and O Streets. He is scheduled to appear with north Omaha activist Willie Hamilton on Channel 22 television on June 18 at 8 p.m. A west Omaha meeting is still being planned as of press time. By the end of June, new precincts and polling places will be determined. According to Phipps, the number may be as few as 20, but Sosa is hoping the number is closer to 40. A joint press conference is planned for July to include Phipps, the community activists from north and south Omaha as well as the elections advisory committee appointed by the County Commissioners. Largely resourced and reported by Kietryn Zychal. For a detailed look at how an election runs in Douglas County, read Anatomy of An Election.